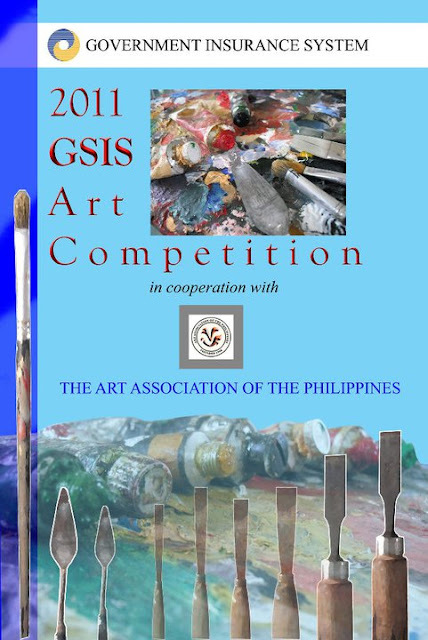 The Government Service Insurance System (GSIS) is inviting Filipino artists to join the 2011 GSIS Art Competition. Now on its 7th year, GSIS is again encouraging the public to be with us in giving tribute to our brilliant artists. For this year, we maintained the three categories and only the representational category has a theme. As we enter the new phase of our competition, we are again calling our artists to explore his best in presenting and conceptualizing his art entry. We want our Filipino artists to join and come in with their new and liberated works. Official entry forms are available in all GSIS offices (Headquarters, Regional Offices and Satellite Offices) and other offices and galleries starting March 14 , 2011. Please read all the mechanics, rules and regulations carefully. The GSIS shall be strict in the implementation of the guidelines set. Entries could be disqualified for technical reasons. II. Non-representational (abstract) i.e. purely non-representational, no-recognizable figures and objects. 2) The competition is open to all Filipino artists age 18 years old (by May 7, 2011) and above. Participants can submit one entry per category. There is no participation fee. 3) The theme for the Representational Painting Category is MAKABAGONG KINABUKASAN. 4) The theme for the Non-representational Painting and Sculpture is open. Artists are free to explore any topic or subject. 5) For the painting categories, the required NEW size is 4 feet x 5 feet (horizontal or vertical excluding frame). Its weight should not exceed 10 kilos (including frame). 6) For sculpture, the minimum size is 2 ft x 2 ft and the maximum size is 3 ft x 3 ft. Weight should be between 30 to 50 kilos and must include the pedestal. Sculptures without the needed pedestals will not be accepted. 6.1 Entries must be done in the generally accepted medium for sculpture such as Metal (steel, brass, copper, aluminum, et al); Hardwood (narra, mahogany, yakal, et al); Stone (marble, alabaster, granite, limestone, et al); Terracotta or stoneware (porcelain, ceramic, et al); Resin and other durable sculpture media. 7) The entry must be dated not earlier than 2011 must be his/her original work, and must not have been exhibited before nor revised nor awarded a prize in another contest. 8) The painting or sculpture entry MUST BE SIGNED but must be covered with masking tape prior to submission, to conceal the artists identity. It must also be properly labeled at the back, indicating the following: Artist (Name, Address, and Contact Numbers) Title of the work, Medium, Size, Year and Price. 9) All participants must be responsible for their entries. The GSIS shall not undertake any pick-up or transportation of any artwork to or from any point of origin. WET PAINTINGS AND WET SCULPTURES WILL NOT BE ACCEPTED. 10) Entries must be submitted at the GSIS Museum located at the GSIS Main Office, Financial Center, Reclamation Area, Pasay City (CCP Complex, Diosdado Macapagal Ave) on MAY 7, 2011 (SATURDAY) FROM 8:00 AM UNTIL 4:00 PM only. 11) Entries submitted before or after the stated date and time shall not be accepted. Mail forwarders coming from the provinces should be advised by the participants themselves that the entry will only be accepted on the said submission date. Participants from the provinces are also encouraged to group together so that bringing or shipping their entries to Pasay City will be cheaper. A] Completely filled-up and signed official entry form with one (1) 1 x 1 ID colored picture. B] Photocopy of ONE valid ID (for age verification). The only acceptable IDs include: Current School ID, PRC License, Drivers License, Official Company ID, copy of Passport, Postal ID, SSS ID, GSIS-E-card, Senior Citizens ID, Voters ID, NBI/Police Clearance, AAP Membership ID. C] 5in x 7in colored photo of the work with the following information written at the back: Artist (Name, Address, and Contact Numbers) Title of the work, Medium, Size, Year and Price. D] Notarized affidavit of the ENTRY FORM certifying originality of entry and subscription to the rules and regulations of the competition. 13) Announcement and awarding of winners will be held at the GSIS Theater. The date for the awarding of winners will be announced later. 15) All major prize winning entries will automatically become properties of the GSIS and will be included in the GSIS Art Collection. 16) Judges may decide not to award prizes if the entries do not meet certain artistic and competition requirements. All decisions of the board of judges SHALL BE FINAL. 17) The intellectual property rights over all prize-winning works and other non-winning works shall be given to the GSIS in perpetuity. This includes the right to use, produce or reproduce, prepare derivative works of the designs for whatever purpose and whichever form as may be deemed fit by GSIS without further compensation to the artist or his heirs and assignees. 18) The GSIS Museum reserves the right to use the name and photo of the artist and his/her entry for free in any broadcast, or print medium. The artist also grants GSIS the right to exhibit the entries as deemed fit. DUE TO LIMITED SPACE, NOT ALL ENTRIES WILL BE EXHIBITED. The GSIS reserves the right to decide which of the entries will be displayed during the competition exhibition. LIKEWISE, THE GSIS RESERVES THE RIGHT TO DECIDE WHICH OF THE ENTRIES WILL BE INCLUDED IN THE CATALOGUE OF ENTRIES. 19) All entries on display should not be sold or taken out from the museum within the duration of the exhibit. The artist is responsible in dealing with the prospective buyer(s). 20) All possible care will be taken for the entries submitted. However, THE GSIS MUSEUM ASSUMES NO RESPONSIBILITY FOR ANY LOSS OR DAMAGE TO THE ENTRIES BEFORE, DURING AND/OR AFTER THE COMPETITION. The artist shall hold the GSIS and/or any of its officers or staff free and harmless for any liability/claims for loss, damage or injury to the works while in exhibit or in storage. 21) ALL NONE WINNING ENTRIES MUST BE RETRIEVED BY THE PARTICIPANTS OR THEIR DESIGNATED REPRESENTATIVES STARTING JULY 9 (SATURDAY) UNTIL AUGUST 27, 2011 ONLY. UNCLAIMED ARTWORKS AFTER THIS DATE WILL BE DISPOSED OF BY THE GSIS MUSEUM ACCORDINGLY. 22) Officers of AAP and other individual artists tapped to assist the GSIS are not allowed to participate in the said competition. To download a copy of the entry form, please click here. For inquiries please call (632) 479-3588 or +63.929.1714091 or email us at museum@gsis.gov.ph. A project of the Government Service Insurance System.